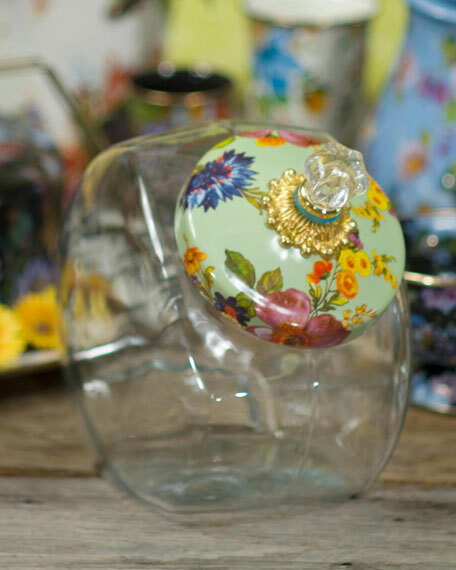 Greet friends old and new alike with a batch of warm, home-baked treats inside our Cookie Jar with Flower Market Enamel Lid. 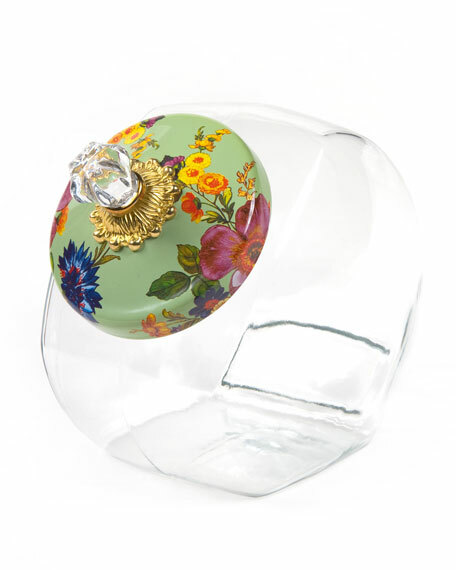 The glass body offers a preview of the tasty goodness in store, and the lid is color-glazed and hand decorated with fanciful botanical transfers that recall a lush English garden in the peak of summer. Equally suited to hold cotton balls on the bathroom counter, clothespins in the laundry, or cookies for your four-legged friends, you'll find yourself inventing uses just to incorporate the subtle splash of garden-fresh color into every room. Heavy gauge hand-glazed steel under body lid hand-painted with signature flower market pattern. Embellished with hand-applied floral transfers rimmed in bronzed stainless steel. Knob assembly includes brass bobeche and glass finial.